Forming large thickets in northern hardwoods and moist mixed (or aspen-birch) forests, especially along borders and clearings and not far from the Great Lakes; abundant in open forests of the northwestern Upper Peninsula and Isle Royale. As noted under R. odoratus, hybrids occur in the very limited area where this species and R. odoratus grow together. Elsewhere in Michigan these two species can be easily distinguished by flower color and range. 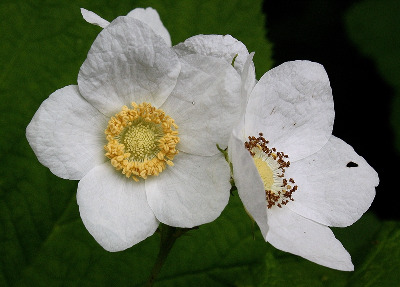 Rubus parviflorus was one of the species found by Thomas Nuttall in 1810 at Mackinac Island; others found at the Straits of Mackinac in 1810 include Iris lacustris and Tanacetum bipinnatum subsp. huronense, these three forming the cover images of the three Michigan Flora volumes, plus Platanthera huronensis and perhaps also Carex aurea. However, of all Nuttall's plants collected in Michigan in 1810, apparently only a small fragment of the Rubus survives in the Herbarium of the Philadelphia Academy of Sciences (PH), as the earliest known plant collection from Michigan (Stuckey, 1967). MICHIGAN FLORA ONLINE. A. A. Reznicek, E. G. Voss, & B. S. Walters. February 2011. University of Michigan. Web. 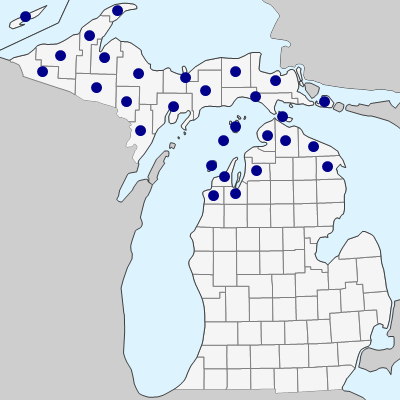 April 21, 2019. https://michiganflora.net/species.aspx?id=2561.